On the right how I would do her makeup. With a little help from photo shop I add some makeup! Her under eyes looked a little grey, I used a peach concealer to counteract that. Taking a lighter shade of foundation I highlight the skin under the eyes, chin and forehead and then use a foundation shade that matches her neck to help even her skin. With Britney going from blonde to brown her brows need to also change, I used a warm brown eyebrow pencil to define them. I picked a lighter peachy/pink blush for Britney's cheeks. 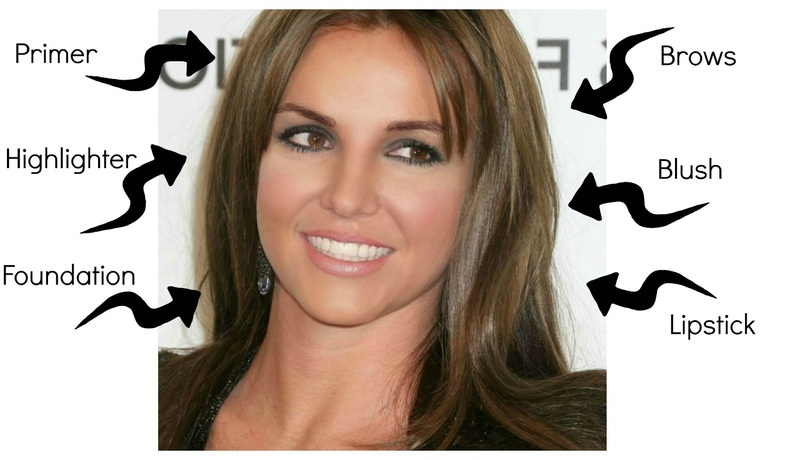 Britney already has strong red colours in her skin so a peachy/pink would neutralise that. Finally for lipstick I blended the lip liner more and added a sheer pink lipstick! Done! Which celebrities makeup would you like to do or redo? ?